Serendipity Reviews: Look what I have! Sometimes I forget what wonderful friends I have. 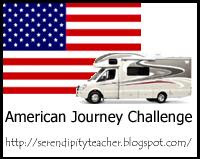 I haven't a clue how to make one of these, but Christina from Reading Thru The Night suggested I have one for my personal American Journey challenge and look, now I have one. My lovely friend Alison made it especially for me to use when I write my posts for my American travels. I shall also put it in my sidebar, so you can click on my progress as I travel around. I am so excited by this challenge and can't wait to start in the beginning of March. I just need to order my books for my first stop Alabama. If anyone wishes to join me on any leg of my American tour, then by all means let me know. This is a marvellous idea! And a fabulous button, too! I don't know how to make buttons either (but I just love them!) This one is absolutely perfect for your challenge. That's a great button, Vivienne. Be sure to stop in FL and MA! Safe and happy travels. Love the awesome button; have fun. That button is perfect! Happy trails! Thank you ladies, I absolutely love it. Can't wait for my corsage too, Anne. I shall wear it with pride. Oh, that is an awesome button! I only recently learned how to make blog buttons, but this one looks beyond my capabilities! If I can squeeze it in, I might read some Joshilyn Jackson with you. Love the button, Vivienne, it's perfect! When you stop in Savannah, Georgia, say hello to CeeCee, Oletta, and Aunt Tootie, they'll keep the porch light on for you! How cool - I love the button! Awesome button :D Good luck with the challenge! cute button and challenge! my hubby and i have taken 3 summer road trips ('07, '08, '09) and have seen all but 5 states. never thought to read through the states. :) very clever. enjoy your 'trip'. I love the button, Viv! You have a great friend there!